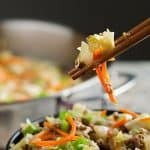 This Healthy Egg Roll in a Bowl has all of the great flavor of Egg Rolls, but it's a sure to please Easy One Pan Meal without the carbs and grains of typical egg roll wrappers. Sooooo excited to share a recipe today that has become a fast favorite in our home. It's a Healthy Egg Roll in a Bowl Recipe, otherwise known by some as “Crack Slaw”. Seriously. You take all of the goodness of an egg roll and remove the outer wrapper and you've got a huge bowl of goodness. Plus you can make it all in just one pan. 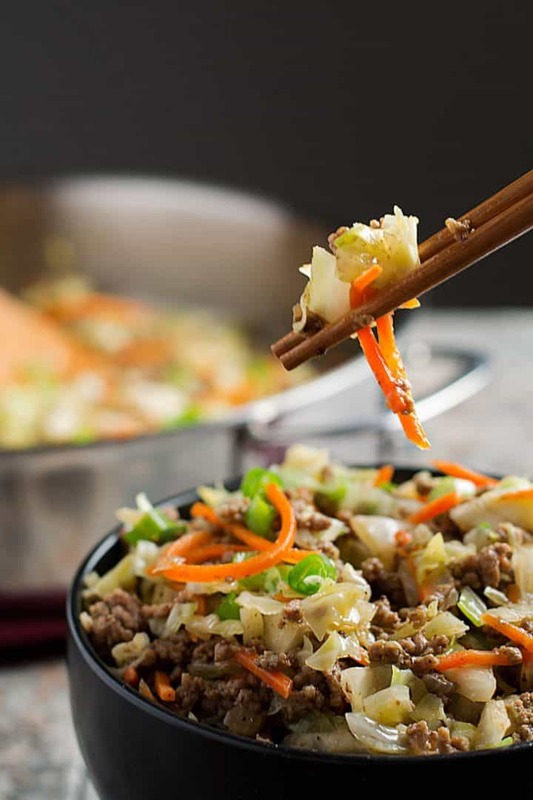 This Egg Roll in a Bowl is the perfect addition to the mix. I found the inspiration for this recipe about a year or so ago. Someone had shared a recipe for Egg Roll in a Bowl in a Facebook group and I was super intrigued. What a concept! I'd always loved egg rolls but hadn't had one in a long time due to our going gluten-free and even leaning grain-free. Too many carbs in those egg roll wrappers, you know? So I just had to make the recipe. It was pretty tasty, but it needed something. So I poked around the internet and found more Egg Roll in a Bowl recipes, then studied a bunch of regular Egg Roll recipes to see what might be good additions to the dish. So I worked on it (and worked on it and worked on it) tweaking it with different seasonings and such, and made this “Crack Slaw” so many times that my family thought I was a little nutty, but I ended up with a recipe that's a real winner in our home. This recipe is great not only because of it's great taste, but also because it works for so many special diets. Is it Egg Roll or Eggroll? You can write it either way. It doesn't matter since both spellings are correct. So go ahead and spell your Eggroll in a Bowl or Egg Roll in a Bowl anyway you wish. Well, maybe writing eggrollinabowl would be a bit crazy :). Cabbage: cabbage is a cruciferous vegetable. The whole family of cruciferous veggies have loads of health benefits including being rich in vitamins and folic acid and minerals such as iron, potassium, and selenium. Note – some say that cruciferous vegetables might be problematic for the thyroid. Carrots: full of beta carotene and vitamins. You can read more about the health benefits of carrots including an apparent reduced risk of cardio vascular disease. I already have some recipes on my site that are perfect for getting dinner on the table in a flash including Super Fast Lentils, Homemade Hamburger Helper, Gluten-Free Chicken Nuggets, Gluten-Free Chili Mac (and more easy recipes), and more. But I could always use more easy meals as I'm sure you could too. The leftovers of this dish are great! 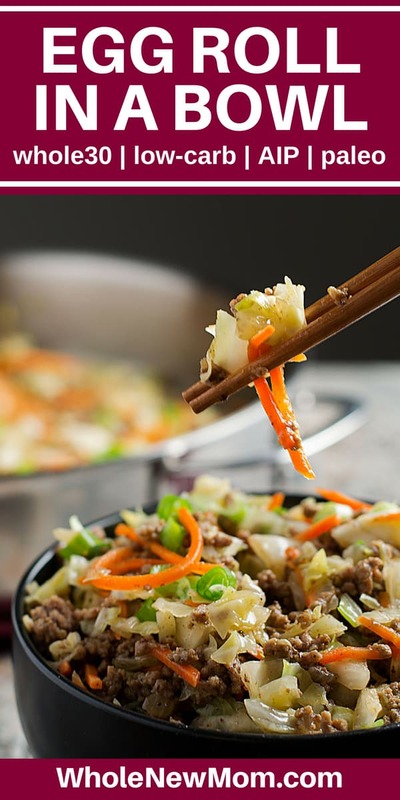 This Egg Roll in a Bowl recipe is fast and the leftovers are delicious. We even like eating it cold. Egg Roll insides for breakfast–YES! The dish freezes well. I haven't frozen and reheated it myself yet, but many readers have tried it and told me it worked great! I've also had readers tell me that this cooks well in a slow cooker or the Instant Pot! You can even serve it as a side dish by omitting the meat completely. Any way you serve it up, it's a great way to get more veggies into everyone in the family. 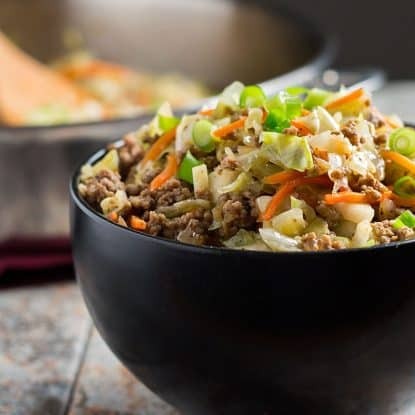 This Healthy Eggroll in a Bowl is already a clean-eating recipe, but it's more than just that–it's easily adaptable for special diets. 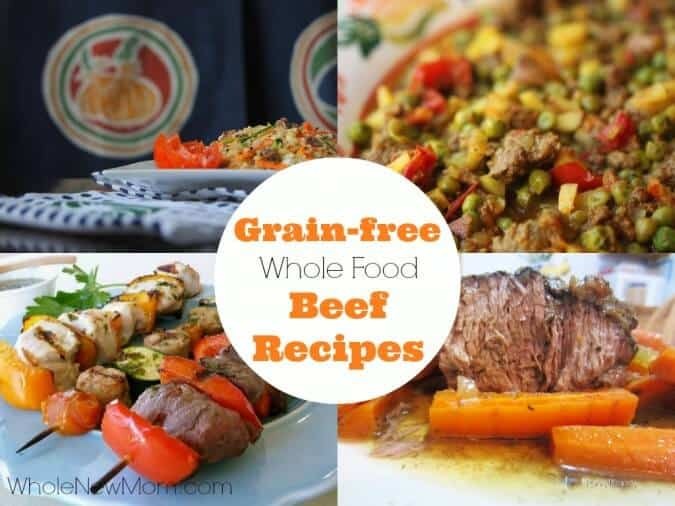 Of course there are no wrappers involved, so this is already a grain-free recipe. Aside from the wrappers, the next ingredient that would be of concern to most “special diet” folks is the soy sauce since soy is a legume and it off limits for many people who have special dietary concerns. Here's how to deal with that. 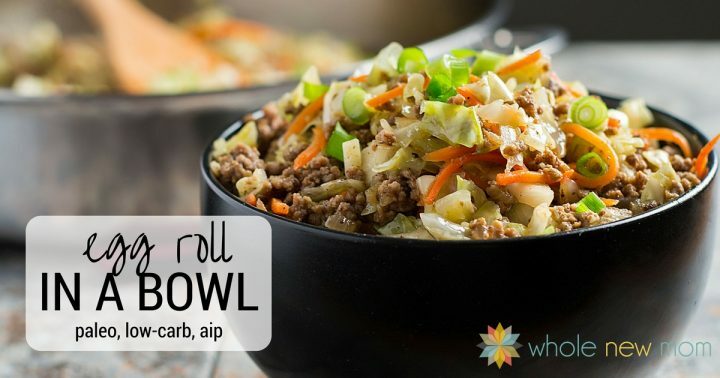 You can make this a Paleo Egg Roll in a Bowl when made with coconut aminos instead of soy sauce, and with the same modification it also works for the Autoimmune Paleo Diet (AIP). It is also a whole30 Egg Roll in a Bowl when made this way. Personally I like tamari more than soy sauce. Tamari is richer tasting and has less gluten than regular soy sauce. You can even buy gluten-free tamari, which is the best of both worlds! The other issue with soy is that it's almost always GMO, so if you are going to use soy sauce, please choose an organic soy sauce. Now, if you're only gluten-free, then gluten-free egg roll wrappers are a great option. But if you're strictly, or leaning low-carb, then they're not an option. 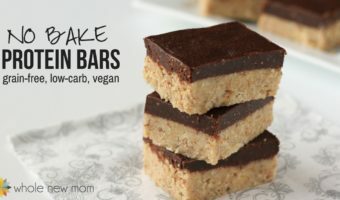 Of course, you could serve this with any kind of wrap (these keto / low-carb wraps would be perfect!) you like or over rice, or on top of cauliflower rice for a huge serving of healthy veggies. 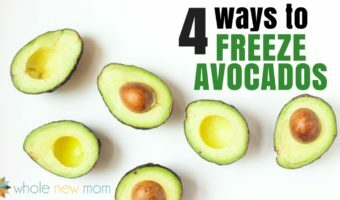 THM: If you are on the Trim Healthy Mama plan, this is an S, E, or FP. It's an S with beef or pork, and E or FP with lean chicken or turkey. Serve with rice, if you like for an E. In my opinion, it tastes best as an S. Use lean meat and reduce the fat to 2 tsp, and use fat-free broth to make it an E and of course you can add extra carrots if you like. You might want a bit more broth but I think it's fine without doing that. This meal can be any type of fuel. With rice, it's a crossover. With cauliflower rice, or plain, and with beef or sausage, it's an S.
Keto: sub in more cabbage or another low carb veggie for the carrots. For AIP or Paleo, use coconut aminos for the tamari. For a vegan option, omit the meat (obviously!) and use a vegetable broth like this one. Here is my Vegetable Broth Mix for a make-your-own option. If you choose to use a broth that contains sodium, you may want to reduce the salt in the recipe. Meat: For the ground beef, you can substitute ground or finely-chopped chicken. Pork can be substituted as well. It can also be omitted for a vegan main dish or for a vegetable side. Tamari: You can substitute either organic soy sauce or organic liquid aminos for the tamari. Stevia / Sweetener: For stevia, 1/16 tsp is equivalent to 2 scoops stevia (see How to Use Stevia). 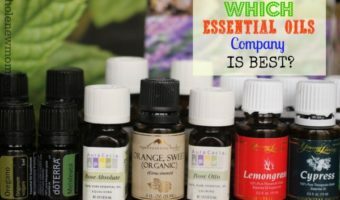 Also, instead of stevia, you can use 4 Tbsp of another sweetener. Sesame Oil: For sesame oil, you want to buy a raw version, since cooking with toasted sesame oil makes the oil bitter. You would only want to buy toasted sesame oil if you would like to drizzle it on top of the egg roll after cooking it. Homemade Garlic Powder: For a nifty idea, here's Homemade Garlic Powder if you would like to make your own garlic powder to use in the recipe. Homemade Broth: If you'd prefer to make your own broth, see Homemade Broth Tips. One medium head of cabbage yields about 8 – 8.5 cups so plan accordingly. A couple of readers have asked me what kind of a pan I use for this healthy egg roll in a bowl. This is the pan I use. 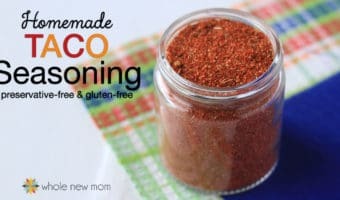 I use it for all sorts of healthy recipes, such as my Honey Bunches of Oats Coconut Chips, Healthy Chili Mac, and Caramelized Coconut Chips. The pan is light and on the thinner side so it heats up fast. I love that it's wider than most pans, giving it a greater surface area for heating, but it also holds quite a bit more than most pans of this type, so you can fit a lot of whatever you are making into it and not have to dirty up multiple pans. OK–with that, onto the recipe! 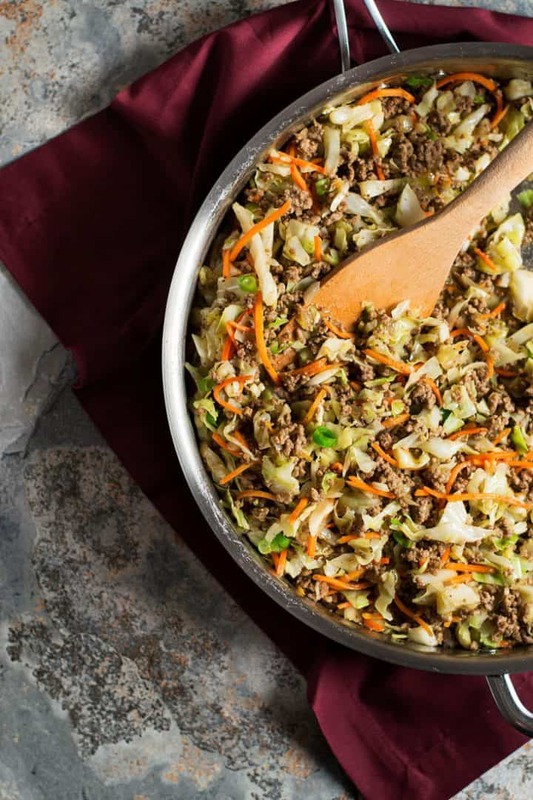 This Healthy Egg Roll in a Bowl has all of the great flavor of Egg Rolls, but it's an Easy One Pan Meal without the grain wrapper! Place meat in large pan and cook until browned. On medium high heat, add the onions and sesame oil. Cook until lightly browned. Add spices, sweetener, red pepper, wine, and broth to the pan and stir well. Add the cabbage and stir to coat. Cook, stirring frequently until the cabbage slightly wilts. Add carrots and cook for 2-3 minutes until soft. 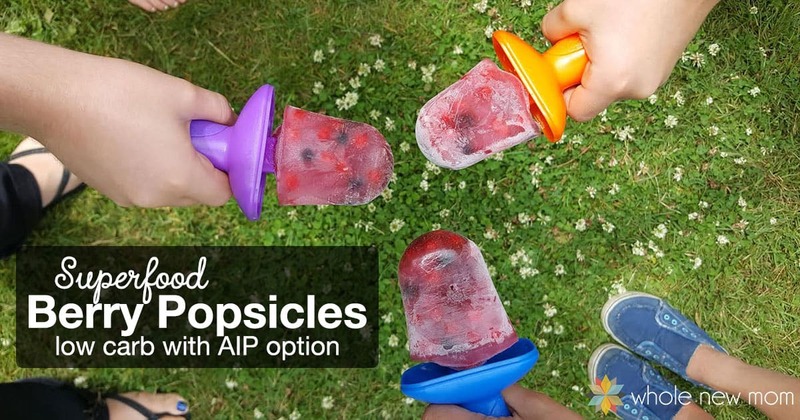 Add tamari to taste and adjust flavorings as desired. Serve plain or over rice or cauliflower rice. Garnish with green onions if desired. The above nutrition facts are estimates only. Please read my Nutrition Disclaimer here. I'm sure this Healthy Egg Roll in a Bowl will be a dish that you will want to add to your family's menu often. Can't wait to hear what you think about it. once you've tried it! Please share in the comments below. You could have at least given some credit Trim Healthy Mama. Actually, I didn’t ever try or even see their recipe. I published this recipe in Jan of 2017. 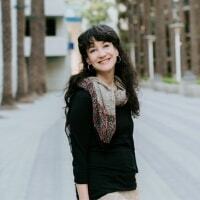 There has been some ongoing confusion about who has recipes published first. I had my gummy recipe published first and sadly had people accusing me of stealing that recipe which was completely not the case. One person reported it on their FB page and I had to clear up that I did not use their recipe and put it out there as my own. The only recipe that I have on my site that is a remake of one of theirs is my version of their Singing Canary (with a lot of added ingredients) and I clearly credited them with it. Any other similarities of recipes are a mere coincidence. I do my best to have integrity in everything that I do. I hope that clarifies things. If you have a concern in the future I would appreciate your asking me rather than making an assumption. Thanks :). For an even easier option, use shredded cole slaw mix in a bag. I also use the little frozen “pop and cook” garlic and ginger cubes I find at WalMart. Easy peasy. Yes true! Can you get those organic? 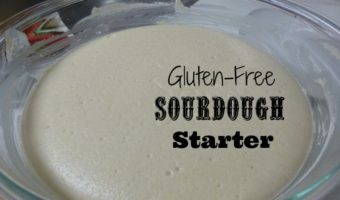 This was delicious and a big hit at out homeschool community pot luck! So glad to hear it! I should take this to a potluck sometime! I am always wondering what I can take that others will like–not sure why I didn’t think about this! Oh my goodness…this is so good!! My 9yr old said it was the best meal he ever had! Thank you for the recipe. I am already planning to make it again. I also was wondering about the nutrition counts, but I will add it up on my own. Not sure if anyone tried but I froze half of the leftovers and they defrosted beautifully for us to enjoy it again. Thanks again!! Just made this. I used 3# Greg and doubled the spices because we likenhearty meals. One word of caution: I don’t think the Ted pepper amount is correct. 1/2 T is a crazy amount of crushed red pepper. I used 1/2 t and it was still plenty spicy (and I’m no wimp when it comes to spice).